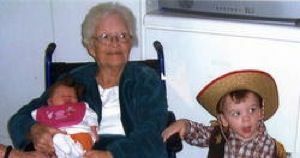 Mrs. Mattie Fussell Matthews Johnson age 91 of 138 Corinth Church Road, Rose Hill died Saturday June 20, 2009 at Carolina East Hospice Care Center in Kenansville. A memorial service will be held at 11:00 am June 22, 2009 from Corinth Baptist Church cnducted by Rev Richard Phillips. Graveside service will be held at 10:00 am at Fussell Cemetery. She is survived by her son, Joseph Matthews and his wife Nancy of Teachey, N.C., daughter Patsy Smith and husband Bobby of Magnolia, N.C., daughter Linda Mills and her husband Bob from Pennsylvania. Daughter-in-law Barbara Matthews of Rose Hill, N.C. Grandchildren, Mrs. Belinda English and husband Bill of Teachey, N.C.
Mrs. Kimberly Barber and husband Phillip of Rose Hill, N.C., Joseph Matthews and wife Michelle of Teachey, N.C., Timothy Matthews and wife Heather of Teachey, N. C., Ricky Matthews and wife Sharon of Rose Hill, N.C., Jim Matthews and wife Patsy of Rose Hill, N.C., Mrs. Jill Smith and husband Tim of Pink Hill, N.C., Roy Matthews and wife Meredith of Rose Hill, N.C., Jeremy Matthews and wife Miranda of Rose Hill, N.C., Todd Smith of Asheboro, N.C., Chad Smith and wife Kylie of Magnolia, N.C.
Brett Smith of Magnolia, N.C. and Bobby, Billy, George and Charles Mills of Pennsylvania. Mattie also leaves 34 Great Grandchildren and one Great Great Grandchild. Born on September 06, 1917 in Duplin County, Mrs. Johnson was the daughter of the late Byrd William and Lela Fussell of Rose Hill, N.C. Mattie was a graduate of Rose Hill High School, she also received a certiface from James Sprunt Community College in oil painting. She was a member of Corinth Baptist Church for more than 90 years. Mrs. Johnson was preceded in death by a husband, William Alton Matthews, husband, Eusebius Johnson , daughter, Anna William Matthews and two sons, Elvin Roy Matthews and James Alton Matthews. A special thanks to all those who visited and sent cards. Thanks to all at Rose Mary Rest Home for their care over the years and thanks to Carolina East Hospice Center for the understanding and professional care given to Mom. The family will receive at Padgett Funeral Home from 9:00 to 10:00 am Monday and after the memorial service at Corinth Baptist Church.